Have fun, live well, explore, and learn to surf. That’s what Pura Vida Surfers is about. 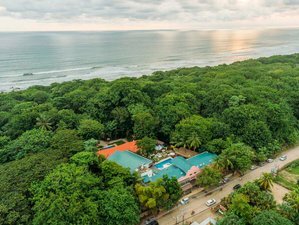 Pura Vida Surfers is a local surf school situated in the astonishing Santa Teresa on the Nicoya Peninsula in Costa Rica. Pura Vida Surfers offers surf lessons for everyone, no matter age, and previous experience. Their goal is to share their love and knowledge about surfing and give you an experience you will never forget! Together with daily yoga classes, this will be a retreat you'll always want to come back to. During this retreat, you will stay at Selina Santa Teresa. Selina is a new-built hostel just 50 meters away from Playa Santa Teresa. The hostel is beautifully decorated, has a nice swimming pool area, and a billiards table. Selina offers many different activities on and off the site. It is located just by the main road with stores, bars, and restaurants walking distance away. Enjoy surfing with Pura Vida Surfers while connecting with yourself. The fun, playful, and challenging surfing together with the mindful, relaxing, and balancing yoga is a combination that many love. Join your hosts in Costa Rica, and enjoy daily yoga classes and surf lessons. By finding focus and clearing the mind, you will progress more in surfing. Breathing is also crucial in surfing and the main focus in yoga. Experience the best of two worlds and go crazy but keep it simple! The schedule for this retreat is flexible. One can decide to do yoga in the morning and surfing in the afternoon, or vice versa. It is also possible to do yoga and surfing head to head in the morning, and have the afternoon off. You will normally surf at 7 a.m., 10 a.m., or 3 p.m, surf lessons will be scheduled according to ocean conditions. The yoga schedules vary depending on the yoga studio. Throughout the retreat, you will enjoy five surf lessons and six yoga classes. The yoga classes are held at different yoga studios in Santa Teresa to provide you many different yoga styles and various hours to practice it. You will build strength, increase flexibility and energy levels, bend, twist, breathe, and release tensions in yoga to become a better surfer. The retreat can be customized. For example, you can add an extra day of surfing or yoga, a rest day, etc. Please contact Pura Vida Surfers with your request! When you book your flight to Santa Teresa you will first land at Tambor Airport (TMU) and then take a shuttle to Santa Teresa (the shuttle takes about 45 minutes). The land transportation fee is included in the airfare, given that you choose Santa Teresa/Mal País as your final destination. Nature Air operates flights from San José to Tambor/Santa Teresa. To book your flight, simply go to their website and choose San José in the "from"-dropdown list, and Santa Teresa/Mal País in the "to"-dropdown list. There is a direct bus from San José to Santa Teresa leaving daily from "Terminal 7-10" at 6 a.m. and 2 p.m. The ferry ticket is included in the price and you do not have to change buses when you get on or get off the ferry. However, you might have to change buses in Cóbano, which is an hour drive after the ferry. Normally, the bus driver tells you to change bus, but if you are unsure, just ask the driver. The bus costs approximately $7. Shuttles leaves daily at 7 am and 2 pm from San José to Santa Teresa. The shuttle costs $50 and we can help you arrange it.